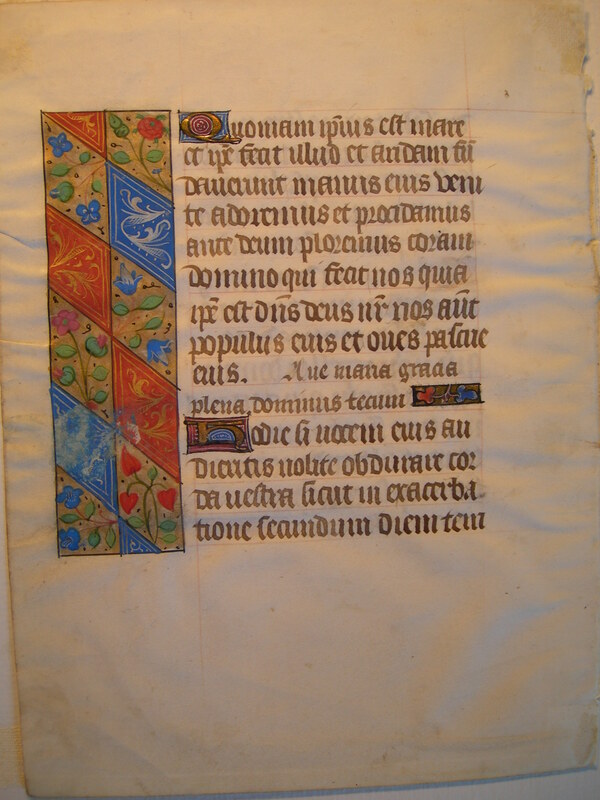 Text: This leaf contains text from the Hours of the Virgin at Matins; specifically, from Psalms 94. Deo salutari nostro: praeoccupemus faciem eius in confessione: et in psalmis iubilemus ei. Ave Maria, gratia plena: Dominus tecum. 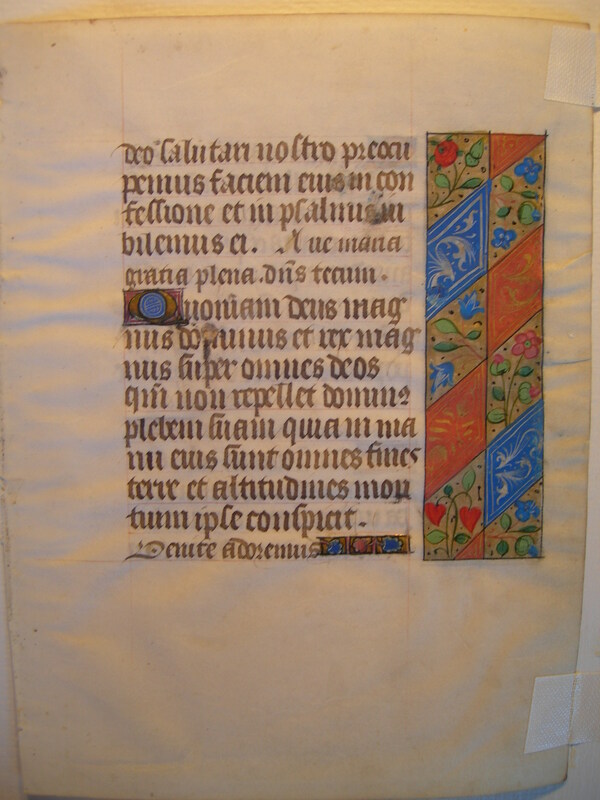 Quoniam Deus magnus Dominus, et Rex magnus super omnes deos: quoniam non repellet Dominus plebem suam: quia in manu eius sunt omnes fines terrae, et altitudines montium ipse conspicit. Venite adoremus. [from Psalms 94] ...let us make joy to God our saviour: let us approach to his presence in confession, and in Psalms let us make joy unto him. Hail Mary, full of grace: our Lord is with thee. For God is a great Lord, and a great King above all Gods: because our Lord repelleth not his people: for that in his hand are all the bounds of the earth, and he beholdeth the heights of the mountains. Come let us adore. Quoniam ipsius est mare, et ipse fecit illud: et aridam fundaverunt manus eius: venite adoremus, et procidamus ante Deum: ploremus coram Domino, qui fecit nos: quia ipse est Dominus Deus noster:nos autem populus eius, et oves pascuae eius. Ave Maria, gratia plena: Dominus tecum. [from Psalms 94] For the sea is his, and he made it: and his hands founded the dry land: come let us adore, and fall down before God: let us weep before our Lord, that made us: because he is the Lord our God: we are his people, and the sheep of his pasture. Hail Mary, full of grace: our Lord is with thee.